Today I found out “Killer Whales”, or Orcas, are actually dolphins. In fact, they are the largest member of the dolphin family, Delphinidae. Now strictly speaking, whales are marine animals of the order of Cetacea and occasionally Cetacea is used to refer to not just whales, but also porpoises and dolphins. However, it generally excludes these latter mariner animals, which belong to the sub-order Odontoceti. So depending on who you talk to dolphins, including the Orca, may be considered whales and dolphins or may be considered a separate marine animal from other whales. But in either case, Orcas are one of the 35 species in the oceanic dolphin family, with its closest relative being the Irrawaddy dolphin. Orcas get their ferocious reputation primarily due to the fact that they’ll eat just about anything handy, including sharks, whales, birds, seals, squid, fish, other dolphins, etc; they will also occasionally temporarily beach themselves in order to grab a snack off the shore or ice. Orcas are at the top of the food chain, so to speak, even above Great White Sharks whom Orcas routinely kill and eat. The Orca has no known natural predator above themselves; they are more or less the “kings of the ocean”. The genus name “Orcinus” means “of or belonging to the kingdom of the dead”; the Orcas scientific name “Orcinus orca” comes from the Roman god of death and the underworld, Orcus. Orcas can render sharks and rays completely immobile by holding them upside down. This also has the benefit of keeping these animals from being able to harm the Orca. With sharks, it will also generally kill the shark within about 10-20 minutes as sharks need to move through the water to breath, unlike Orcas. Orcas have been known to assist whalers in hunting whales. Once a whale has been killed the Orcas then try to eat some of the dead whale carcass before it can be brought aboard the ship. Outside of Orcas in captivity, there has never been any confirmed case of an Orca killing a human and only a few wild Orcas attacking humans where the Orcas confused the humans for its normal food or were merely appearing to play with the humans for fun, as is common with many types of dolphins. Captive Orcas however, attack humans much more frequently and some of the attacks have been fatal. Before they were known as Orcas, Killer Whales were called blackfish and more commonly “Grampus”. Orcas can live up to 90 years old in the wild, though more typical age ranges are between 30 and 50 years. In captivity, they tend to live only around 20 years. Adult male Orcas typically grow to about 30 feet long while adult female Orcas grow to around 20 feet long. Their weight ranges between 3 and 10 tons. 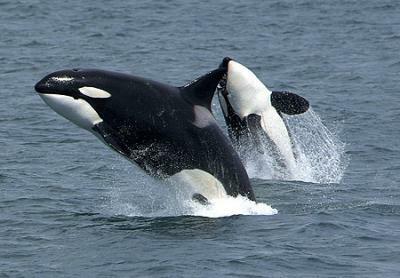 Orca females can breed up to around age 40. Orcas can be found in all the world’s oceans, but they are more often found in the Arctic and Antarctic as well as off the north-west coast of America and along the west coast of Canada. Like other dolphins, Orcas use echolocation to hunt. Also like most other dolphins, they can be found working together to hunt, doing such things as herding schools of fish into a small area for easy consumption and even having one Orca jump onto the shore to scare animals into the water where other Orcas are waiting to eat them up. Orcas have the second largest brains of all marine animals. According to one research study on the complex social interactions and communication between Orcas, they found that Orcas “appear to have no parallel outside humans” in terms of their cultural faculties. They live in pods generally consisting of 5-30 Orcas and establish social hierarchies lead by families with complex forms of communication, including different dialects of language, depending on the pod. It is thought that the name “killer whale”, even though it’s a dolphin, came from sailors and whalers observing that Orcas frequently killed whales and ate them and thus they were known as “whale killers”, which eventually morphed to “killer whales”. woah michelle thanks for pointing that out, i thought he was talking about whales baking, and i was so confused. The scientific term Cetacea always includes dolphins and porpoises. The informal term whale sometimes refers to all cetaceans and sometimes excludes dolphins and porpoises. This “article” has it backwards… whales, dolphins and porpoises are all members of the order Cetacea. The suborder Odontoceti includes all the toothed cetaceans – sperm whales, orcas, dolphins and porpoises (among others). So by the logic of this article, sperm whales are not whales, they are dolphins. It would be more correct to say dolphins and porpoises are whales rather than say orcas are dolphins. Nope. Orcas are a species of cetacean within the family “delphinidae”-oceanic dolphins. A family of Odontoceti. Orcas are the largest species of dolphin. They are correctly referred to as such. Lachlan has it. In the largest sense, the general population will say “whale” as the big guy and Dolphin as the small smiley one. Technically though, marine biologists and taxonimists have both Dolphin and Killer Whale in the same Order, “Cetacean” (from the greek word ketos, meaning WHALE). They are even in the same Suborder, “Odontoceti” (toothed Whale). They are in the same Family as well, “Delphinidae” (Dolphin Family). Killer Whales are the largest of the Dolphin Family. A dolphin and an Orca are both whales. Now some biologist will insist that from common language and sheer size that dolphins (and porpoise) should not be called whales. You just have to ask what Suborder are they both in and they will have to say Odontoceti, toothed whales. 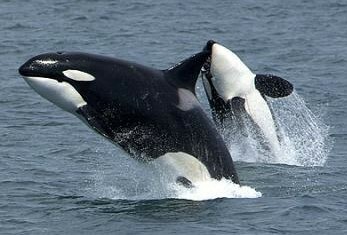 They say killer whales are really dolphins but if you ask me they’re just as cool as whales! Orcas in the wild actually live to be over 100. I think the oldest known orca is a 160 year old female.